An angle most people have likely never considered. I know I didn’t think of this. Cilacap (ABC News/ Louise Milligan): Across the water in the town of Cilacap, the Christian undertaker who will provide the coffins for the executions spoke to 7.30. Suhendro Putro will also bathe the bodies of Andrew Chan and Myuran Sukumaran after they are executed. 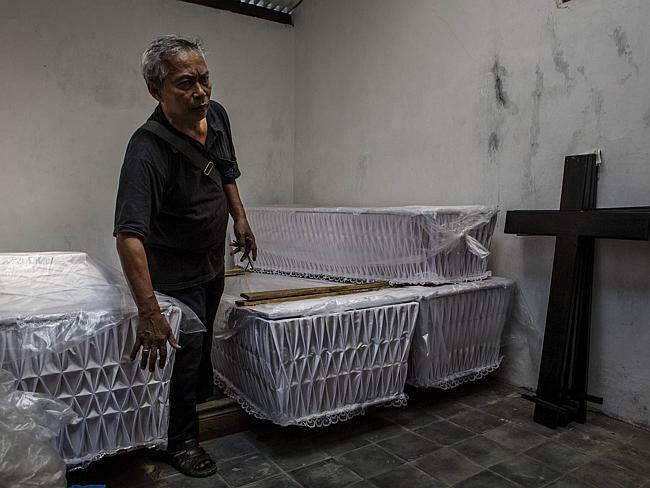 He keeps his coffins in a small back room behind the church in central Cilacap. Six weeks ago, Mr Putro prepared the caskets and tended to the bodies of the last six drug traffickers executed at Nusakambangan by Indonesia.